Posted October 4th, 2011 by Karl & filed under MailBigFile News. It’s not everyday that you get the chance to win big when you spend little, but that’s exactly what we’re proposing here at MailBigFile. Starting next Monday and each Monday after that, every single Pro Account purchased on that day (whether it’s the 24 hour, yearly, 2 yearly or a renewal) will automatically be entered into a draw to win a fabulous prize. The prize itself will vary week by week. 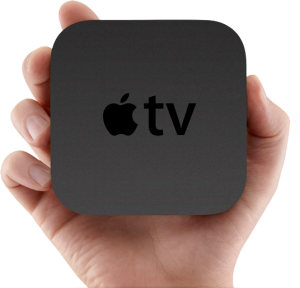 However, the first prize to be offered on the draw will be an Apple TV worth £99. So, if you bought a Pro Account for a measly £10[i] on Monday, you could end the day with an Apple TV worth £99. Best of all, there’s no catch to the prize! All you have to do is buy a Pro Account – any Pro Account – and you’ll automatically be entered into the draw. We will contact you if you win and send you your prize from there. What’s more, you don’t just have to buy a new Pro Account to enter this competition. Those who have their accounts renewed on the Monday will also be entered into the prize draw. Meaning if you renew your account early, you’ll also be a part of the competition. Of course, there are Terms and Conditions for the competition. You can find these by clicking here. If you have any questions about the competition, or any general enquiries, please either comment below or contact me at support@mailbigfile.com. [i] £10 is the base price for a year. For UK customers this includes applicable VAT. Other currencies prices will vary. These can all be found here.